Genesis Vila-Diaz learns to make shakshouka during week three of the spring 2019 My Daughter's Kitchen cooking program at Hunter. Bayard Taylor chefs Merelyz Perez and Gabriel Ortiz take charge of the shakshouka sauce, stirring regularly to make sure it doesn't stick. The word “Shakshouka” means “a mixture” in Arabic, and we certainly got a mixture of reactions to making this international dish from the Middle East and northern Africa. And the food was not the only thing providing international flavor at our third class of the spring. We had a visitor from New Zealand on the other side of the world — teacher Linda Molloy’s grandson Leo. To get a feel for where Shakshouka — and Leo — come from, we borrowed a globe from the office and located New Zealand and the Middle East on it. Then it was on to making a dish that’s different from anything our young chefs had ever tried. To start, we watched a short YouTube video of Shakshouka being prepared, so our chefs could see eggs used in a new way in a recipe. Then Gabriel Ortiz volunteered to mince the garlic — and did a great job — while guest Leo Molloy took on the onions and Mirelyz Perez and Bryttanye Vasquez made short work of the red peppers. It was good they were fast in this phase, because what they really wanted to do was get the sauce simmering so they could drop the eggs into it. This was the most interesting part, they agreed, and to smooth the process we cracked the eggs into individual cups. Once the eggs had firmed up, our chefs lined up with plates of pita bread to get their first taste of Shakshouka. With the eggs and tomato sauce, it was a colorful meal, but what did they think of it? Reactions were mixed. Gabriel liked it a great deal, had a second helping and asked to take some home. It was thumbs down for Bryttanye and Mirelyz, however, who felt that the sauce made the dish too goopy for their taste. Still, part of the adventure of My Daughter’s Kitchen is to try new things, sample new flavors and form opinions. And in this lesson our chefs learned some geography, too! We only had one student in attendance this week, and she was a star! Genesis did most of the prepping and cooking herself with some chopping assistance from the volunteers. After trying the shakshouka, Genesis admitted that it was very tasty and not “disgusting” as she had expected. She was very surprised because she does not like vegetables! Perhaps she is now willing to be more adventurous with trying foods! Aniyah tries the shakshouka that she and other students learned to make during week three of the spring 2019 My Daughter's Kitchen cooking program at Team Up Philly at Universal Daroff. You can’t control the weather! A snowstorm forced the cancellation of our second class so we decided to double our recipes in week three. That was a tall task for our students, some of whom were just getting accustomed to handling a large chef’s knife, but they were more than up for the challenge! It helped that our chicken soup and shakshouka recipes relied on many of the same techniques and complemented each other so well. The vegetable and poached egg shakshouka was fun to pronounce but so unfamiliar. We were surprised that all but one of our cooks really liked it. Kalen wrote that “the shakshouka made me really surprised,” by how much she liked it. A'Zon Young dips into his first shakshouka during week three of the spring 2019 My Daughter's Kitchen cooking program at Wiggins School. There was much anticipation over the shakshouka as no one had ever had anything like it. Eliany Chavarria said she had a soup like this once, but not with an egg. A debate carried us through the meal preparation: Is this breakfast? Is this dinner? No matter what it is, Juan Rivera declared it a “great new combination of flavors.” And after finishing his bowl, A’zon Young keenly observed, “If we can make healthy food this good for under $20, why aren’t they serving us this at lunch?” Good question, A’Zon! Cheyenne Rivas spreads the cooking aroma to Maeve Taffe during week three of the spring 2019 My Daughter's Kitchen cooking program at Comly. The Comly Culinary kids were abuzz with excitement this week. Due to the snow the previous week, they were anxious to get back into the kitchen. The only problem… no one knew how to pronounce the dish we were preparing. That’s where Google came in and helped! We unpacked all the ingredients and checked the recipe. “What is the green stuff?” asked Jaesha Benjamin. LiLa Mora proudly announced, “Cilantro!”. The chopping began, and it was LiLa’s first time chopping garlic. She exclaimed, “The garlic is so sticky, I can’t get it off my fingers!”. The oh’s and ah’s started when the onions, garlic and peppers were added to the skillet. Next came the spices. Maeve Taffe said, “We are using a lot of spices I’ve never used before. The coriander smells like peppermint, and the paprika in the pan smells like BBQ!” Cheyanna Rivas helped with everything. Over all, we all thought it had a good flavor but most of us did not like poached eggs. But, it was something they could all make for their families! Reyna Barr, Leila Anderson, and Stephany Santiago prep ingredients for the shakshouka recipe during week three of the spring 2019 My Daughter's Kitchen cooking program at Sacred Heart. It was a good second class after being snowed out last week. We talked about My Plate and the importance of veggies and fruits in your diet. The kids were excited but a bit wary to make and try the shakshouka. “I’m very curious of what this dish will taste like. I don’t usually like trying stuff...But you never know if you don’t try," said Leila Anderson. We had varying responses to the meal with most saying it wasn’t their favorite but they all did a great job trying it! CJ Williams, Mia Soisser, Sophia Heavens, and Vincent Vadeanu chop veggies for shakshouka during week three of the spring 2019 My Daughter's Kitchen cooking program at Loesche School. This was a good menu to have two subs attend and then Andrew Ramos came back, which made six. We began to read the recipe and Hamza Alnatsheh said, “My dad makes this at home.” There was a lot of down time while the shakshouka was cooking, which allowed us to concentrate on the different spices and cooking methods. Everyone began chopping and measuring the ingredients quickly. We also discussed how to use a cast iron skillet. Susan Munafo told them to be careful with the handle because it gets very hot and stays hot. “Did you ever touch it?,” asked Sophia Heavens. “Yes, and never again!” she replied. Lâ€™Unique Deedon proudly shows off her plate of shakshouka during week three of the spring 2019 My Daughter's Kitchen program at Chester Eastside. She gave the dish a thumbs up. Our chefs took great pleasure in making this week’s dish of shakshouka, especially cracking the eggs and adding them to the skillet. We had only one minor egg “casualty” – an egg whose yolk broke while being shelled. Joelize Vasquez and Elena Tran-Valentine slide their cut ingredients into the frying pan during week three of the spring 2019 My Daughter's Kitchen cooking program at McClure. Students learned to make shakshouka. This week at McClure I had a lot of excited, eager, and ready-to-cook students who were looking forward to trying this week’s dish. Everyone was more than willing to jump in and do his or her part in getting our meal together. We had several staff members stop by on their way home telling the students how wonderful and delicious everything smelled, and that they all wished that they could have stayed to try the meal with the students. Kaylie Cafferty, Joseph Alejandro, Yessenia Juela, and Julian Lebron add tomato sauce to the shakshouka during week three of the spring 2019 My Daughter's Kitchen cooking program at Pollock. Students at Philadelphia Montessori Charter School learn to prepare shakshouka during week three of the spring 2019 My Daughter's Kitchen cooking program. 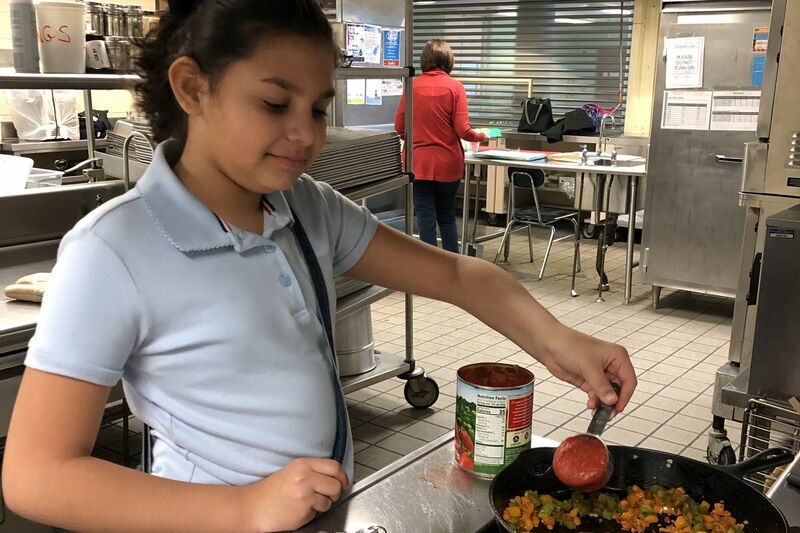 Students at Elkins Park School learn to make shakshouka during the spring 2019 My Daughter's Kitchen cooking program. Jermaine Brown and Malaysia Williams take a turn stirring ingredients for shakshouka during week three of the Spring 2019 My Daughter's Kitchen cooking program at Urban Promise. We skipped ahead this week to make shakshouka, a dish the class liked saying out loud but were skeptical about eating. “Does not sound like my cup of tea,” said Jermaine Brown, and Malaysia Williams was in agreement. A quick taste of the feta cheese did not change their minds. It didn’t take long to get everything chopped and diced and the tomato stew simmering. Everyone took turns cracking the eggs and gently sliding them on the simmering mixture. Our kitchen did not have a lid to fit the skillet, so we improvised with a cookie sheet. When it was time to eat we had some mixed reviews. “It just needs a little salt,” said Jermaine, who asked for seconds. But even with a little hot sauce, Malaysia was not won over. “Maybe it needs some chicken,” she said. Egypt Scott watches as Morgan pours an egg into the skillet for Shakshouka at Wissahickon Charter School Awbury campus.